This post I am breaking away from the updates on triathlon training and my progress. Not too much to report in that area, as it really comes down to the fact that I am doing a lot of swimming, biking, and running, amounting to about 20 hours a week in total. Besides, it is good to highlight the charities which work to do good in the world. Recently we ran a fundraiser for Alex’s Lemonade, and the response was fantastic. We made nearly half our goal of $1,000 to help in the fight against childhood cancer. Today I want to put the spotlight on another unfortunate reality in our world – poverty. Organizations such as Compassion International, or Feeding America, do their own part in trying to bring comfort and stability to those affected by poverty. Up until a couple years ago, I would make myself so angry by the fact that “we” did little to end the suffering of those people living below the poverty line in the world. That for a fraction of the money we spent on wars, we could provide much needed aid to all the world’s children. Yet in my self-righteous indignation, what was I doing to be of service to those very people for which I was trying to be an advocate? Nothing but complaining and whining about how “we” as a community, nation, and world weren’t doing more. Once again I was wasting all my energy on things I could not control and had no influence over, while neglecting the service which would provide help to those in need, and serenity to me. The statement above doesn’t necessarily imply that the poverty issue can’t be solved. Maybe it can. But individually, our responsibility is to serve each other. If we fulfill on that responsibility and treat others as we ourselves would wish to be treated, then more people in need would be given a helping hand. And many small acts of service on a global scale will make a world of difference. Perhaps that is the “solution” we are looking for. If you would like to be of service today, you can donate to one of our fundraisers for Feeding America or Compassion International. Also, you can visit the Compassion website and sponsor a child in a developing country. It is a very rewarding experience. After my previous race experience, needless to say I was a bit cautious coming into the Long Beach Triathlon. My expectations were lower, I had already made this a non priority race, and I was two hex-bolts away from putting training wheels on my bike. Overboard? Maybe. But I didn’t want to risk eating asphalt salad again (by the way, “Asphalt Salad” would make a great band name!). You can read all about my expectations in my previous post here. All that being said, as I went to pick up my race packet on Saturday morning, I got a view of things to come. The weather was absolutely beautiful with no wind. The water was calm and inviting. Much of the bike course was a grand prix race course (designed for fast racing). The run was flat. While this was a short “secondary” race, the conditions were about as perfect as they could be, which made me second guess my conservative approach. What better course to give it all I have and see how well I do? This post is “media rich”, with plenty of photos and video to help you kill some time. Many thanks to my wife, Marie, who took full advantage of our new Nikon D7000 and got some great shots! So without further ado, here is the race report. I arrived at the transition area about an hour early, set up my stuff, and started eating some oatmeal (this has been my pre-race meal of choice, as it has not caused me any GI problems in the past, and gives me plenty of carb energy). I made my way to the swim start by jogging the path in my wetsuit. I was the only one doing this, and I heard a lot of comments along the lines of “the race hasn’t begun yet,” and the like. However, I find it is essential to get a good warm up in before a race. Why would you ever want to start out stiff and cold? I was having some issues with my goggles filling up. Turns out there was a small crease in the rubber seal, that probably came about because they were left in the hot car (only thing I could think of). I had trouble fixing this, but my backup pair was back at transition, and the race was about to begin. At this point I took my own advice and just “let go” of the situation and do the best I could. Swimmers begin rounding the buoy’s and heading for shore. Further good news was about to hit me, as I recognized that most of the bikes in my age group were still present in the transition area (which meant that many people were still in the water). Transition went smooth, as I was able to get my wetsuit off, and socks and shoes on, quickly without a problem. My only mistake came when I didn’t turn on my GoPro before the race. This took me about 15 to 20 seconds to address, but I couldn’t afford not to film the bike portion! That would be doing all of you fine people a disservice! The rest was easy. I ran to the mounting area, got on my bike, and there I went! Again, my goal was to take the bike conservatively, but in sections where it was safe (straightaways, wide areas, etc.) I would put the hammer down as hard as I could. It was really the turns that had me nervous, as I didn’t want another rider to clip me or try to cut by me on a sharp turn. I found that I would get passed by a few people on each of the sharp turns, but then I would reclaim my position on the straightaways. Thus I think the reward for aggression is minimal and short lived. Everything went absolutely perfect in T2, I don’t think I could have done anything any differently. This time I saw only two or three bikes, which told me I was still in good shape. Got my running shoes on and my race number, and sprinted outa there! The run was much like the bike in that the first lap was empty, aside from faster 20 somthing’s passing in the opposite direction toward the turnaround. The second lap was more congested, but I found it more easily navigable, and was able to continue passing people while maintaining my pace. It was a great feeling as I approached the turnaround the second time and the volunteer pointed to the turnaround but I was able to point to the finish and go through the chute. I didn’t really hit the gas at all at the end of the race, but I should have finished strong. But at least I finished feeling like I didn’t need to puke. The best part is I looked at the time as I crossed the finish and saw “1:13:00”. This meant that I actually beat my goal by 2 minutes! I then realized that, being in the second wave, we started 3 minutes after the first wave. That means I beat my goal by 5 minutes! Overall, I enjoyed this race. The course was great, the climate was awesome. Organization had a lot to be desired, but I can’t complain about a fifth place finish in my age group. I wasn’t aware of my placing when they first began posting results, as they were just posting overall. I could see that I did pretty well. As I pushed through the crowds to see the posted results (in the smallest font possible), I tried to determine how many 30-34 age groupers were ahead of me. I thought I saw two or three, but I couldn’t tell. While we had other plans for the day, I had to convince my tired wife and kids to stick around for the awards ceremony. The awards ceremony wasn’t very organized as they were giving awards out to the relay groups and youth groups before getting to the age groups. They announced the names and I found out that I didn’t get a podium spot (which was okay, because it wasn’t very organized – they didn’t have a podium). I was just happy with my performance. Given this was a “B” race and I didn’t want to be aggressive, I think my time was awesome. When I got home I learned that I got 5th place in my age group, and missed third by a little over 2 minutes. For my second finished race, this is not too shabby. Putting this into perspective, at an Ironman race, there are 50 spots allocated for the Kona World Championships. At times, 30-34 will get at least 5. Being 40th overall, and 5th in age group would secure a Kona spot! Granted, the Ironman is a lot more competitive, a lot longer, and a lot more challenging, but I have time, patience, and determination. It may not happen next year, or even the following year. But the point is that for the first time that goal actually appears on the horizon and looks achievable. I think I’ve come a long way in the last year. Great things are yet to come! This coming weekend I venture out to compete in my third triathlon this season, The Long Beach Triathlon. If you’ll recall in previous posts (here and here), I have experienced two of the extreme outcomes thus far; exceeded expectations, and a literal faceplant. While the joy of doing well and my competitive spirit are urging me to push it to the limit on Sunday, Long Beach is by no means an “A” race. In fact, it’s not really even a “B” race. Since I am training for longer distance triathlons, the sprint distance triathlons to this point have been a means to get myself comfortable with the process. Not to say that I’ve “been there, done that”, as I have a great deal of respect for these races, the sprint is just a different kind of race. Where longer distance races promote patience, the sprints are, as coach Mark Allen says, “fast and furious”. My instinct tells me to run like hell, but my plan is to get my money’s worth during this race. I plan to take things conservatively, especially on the bike, and whatever happens happens. In most races I tend to want to leave everything on the course, not leaving feeling like I could have given more. Unfortunately in my last race, I left everything on the course, including some of my face and shoulder. This time I guess I plan to take some of it with me. I’ll leave some of it on the course, but I’m going to take a lot of it too so that I will be in good shape for my next races. Speaking of the next races, I am upping the distance from here on out. In October I will be competing in the inaugural Lifetime Fitness Oceanside Triathlon. This will be an olympic distance race, which is a 1.5k swim, 45k bike, and a 10k run. Then in December I will be competing in the HITS Half Triathlon in Palm Springs. This will be a 1.2 mile swim, a 56 mile bike, and a half marathon. That one I am looking forward to because it will be a light field, and it will be much cooler out (I seem to do better in the cold). In these two races I plan to bring my “A” game and leave it all on the course. Swim as fast as I can with good form – In the previous races I took the swim very conservatively and was able to improve my confidence. I want to push a little harder to see where this puts me. This will probably put me in the front of the middle of the pack. Practice smooth and fast transitions, getting in and out in under 2 minutes. Bike conservatively, focusing on keeping the rubber on the road, and not playing cat and mouse with aggressive racers. Run as fast as I can with good form. So in reality, I am hoping for very good swim and run splits with an acceptable bike split averaging 20 mph. It should be a fun race, and I’m really looking forward to completing it. Be assured that a race report will come shortly after. It’s amazing how a little gesture can go a long way. 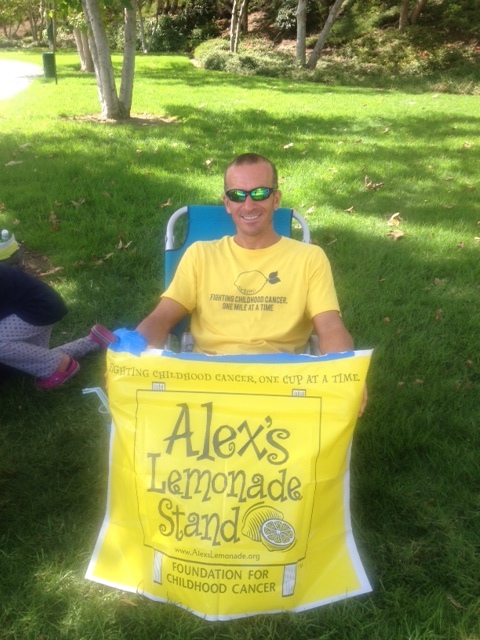 This past weekend we hosted a lemonade stand as a fundraiser for Alex’s Lemonade Foundation, as a way of supporting one of my Ironman charities, and as a way to celebrate my wife’s birthday. First off, let me just say how lucky I am to be married to a woman who chooses to give of herself on “her day”. She is wise beyond her years, as she has come to realize that there is no greater gift to give yourself than to give freely of yourself. This weekend was no exception. Through the generosity of many anonymous and thirsty passers by, along with loved ones coming out for support and donating online, we were able to raise nearly $300. Not too shabby for a few hours work selling lemonade (I certainly couldn’t have imagined making that kind of coin when I was a kid). Thank you to everyone who came out to support the cause and gave generously. With these donations we have made it almost halfway to our goal for this charity with a few months to go, and this has strengthened my spirit and commitment to the goals of all three charities. It makes the training and the racing so much more enjoyable and fulfilling to know that at least a small amount of money is being donated to charity. The support of the people who read this blog and contribute to these fundraisers helps me to renew my commitment daily to work hard to achieve the goal of finishing an ironman. I would highly recommend to anyone who wants to live a fulfilling life to set an extreme and achievable goal for themselves and find a way to be in service while achieving that goal. The service will be the most fulfilling part of the journey. This was the setup for our lemonade stand; modest, yet effective, and the lemonade (prepared by my lovely wife) was delicious! Zack & Sarah are natural salespeople (unlike their daddy). 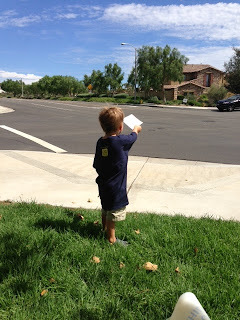 They were fearless (almost too much so) at approaching people and telling them about our cause. 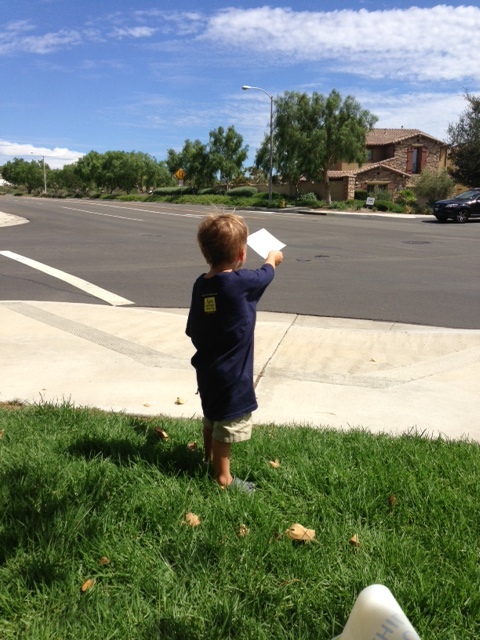 It makes me beam with pride to know that they are learning early how to give freely of their time. 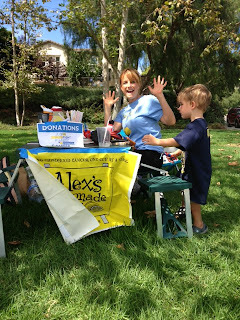 Here, Sarah promotes the stand while a thirsty patron enjoys refreshment in the shade. Thanks again to all those who came by to support the cause or donated online. If you couldn’t make it, you can still donate to the fundraiser by clicking here.